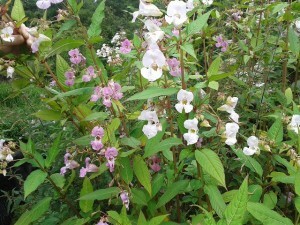 Himalayan balsam or Impatiens glandulifera originates in the Himalayas – surprise surprise. It was introduced to Europe as a garden plant but it quickly escaped the confines of the garden and joined the ranks of ‘Invasive Pests’. Other such plant species include Japanese knotweed, Giant hogweed, Sycamore or Acer pseudoplatanus and Trifids. An alternative explanation for its arrival in this side of the world is the cotton industry. 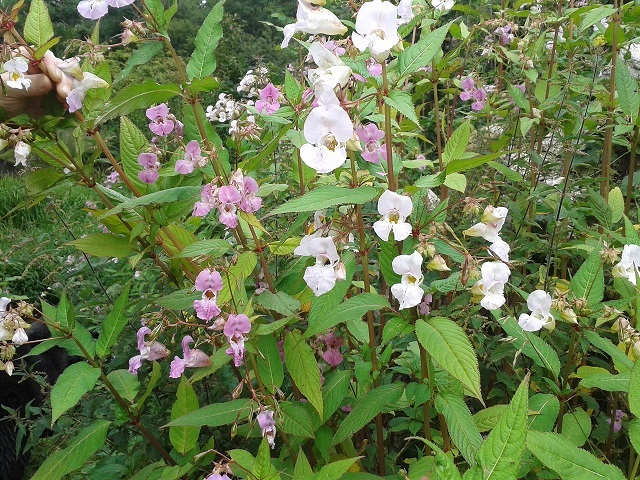 Balsam seeds came in with raw cotton bolls and during the cotton milling process they escaped into the rivers. The cotton mills being powered by water were of course situated close to fast moving water. I like this idea because it fits neatly with childhood memories of holidays in Lancashire 50 years ago where Himalayan balsam was a common occupant of stream banks and ditches. Like the ditch near the sweet shop where we used to buy sherbert in paper cones. 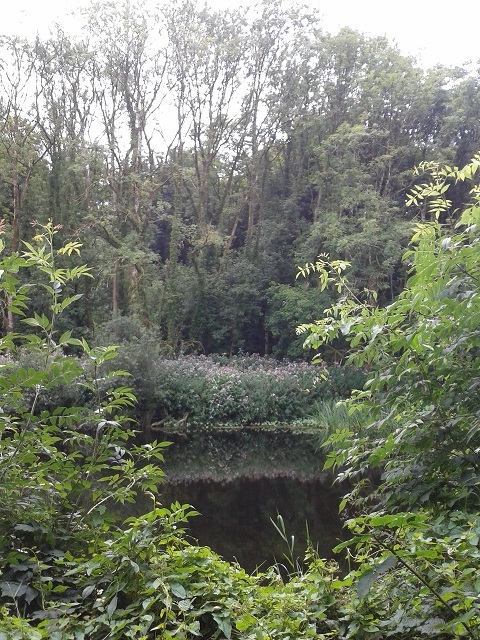 Himalayan balsam has become unpopular because it spreads very quickly along watercourses and pushes out the native perennial vegetation. The fancy name is Impatiens glandulilfera the same family as Bizzy Lizzies: aka Impatiens walleriana. ‘Impatiens‘ because the ripe seed pods burst – impatiently – in your hand, firing seeds into the distance. The ‘glandulifera’ bit relates to its creepy mucus-secreting glands which are thought to be redundant artefacts inherited from carnivorous ancestor plants. The unpleasant rank smell is thought to come from the mucus. That smell takes me right back to the sweet shop and the sherbert. Actually when you look at the pink or white flowers there’s a bit of the Pitcher plant about them with that frilly-lipped, gaping mouth and bulbous back end. The plant is tall and stately – often topping 6ft in height – taller than many policemen nowadays. It can possibly reach as high as 10ft. You’ll recognise this chap of course – this is the actor Jack Warner as PC George Dixon in the black and white 1950 film ‘The Blue Lamp’. 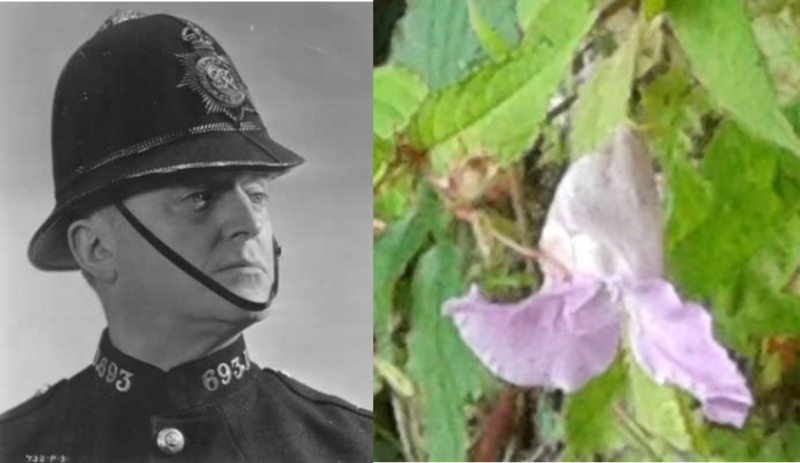 You’ll see from his old style police helmet exactly how the Himalayan balsam got its common name. The flowers are approximately the same shape but as if worked on by a gay milliner. 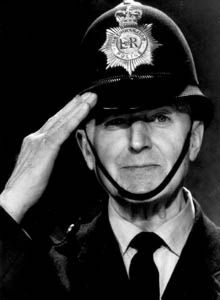 After his success in ‘The Blue Lamp’ (1950) with Dirk Bogarde – PC Dixon escaped the confines of the old black and white movie and went global (like Himalayan balsam) as ‘Dixon of Dock Green’ occupying TV screens across the nation from 1955-76 by which time he was in his eighties and available in colour. 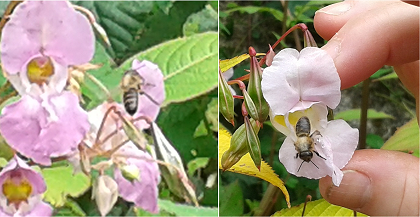 It is a very popular and reliable plant for the bees who will travel some distance for the nectar. Flowering as it does in August it fills the gap between the end of the summer main crop and the autumnal ivy flow helping the bees going into winter. Popular too with beekeepers who may take a late summer crop from it. 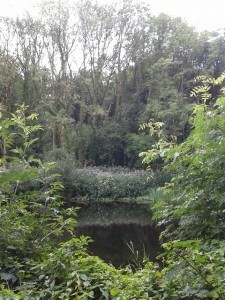 William Robinson and Gertrude Jekyll also have a lot to answer for as they would have introduced invasive species into their gardens he advocated the embellishment of woodlands utilising the naturalisation of exotics from the sub-tropical garden with an emphasis on foliage planting, these included Rhododendron ponticum, Giant Hogweed, japanese knotweed and Himalayan Balsam.